A delegation of officers on board the helicopter carrier “Gamal Abdel Nasser” visited the SAES facilities, during the scheduled events while their stay in Cartagena. The vessel LHD type Mistral “Gamal Abdel Nasser”, the flagship of the Egyptian Navy recently acquired to the French government, accompanied by the frigate ‘Tahya Misr’, has made a stopover on the training cruise that these Egyptian units are carrying out in the Mediterranean. 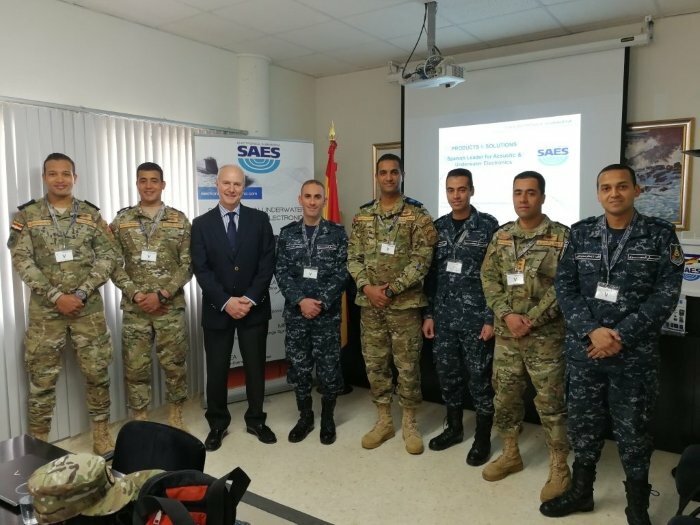 SAES has taken the opportunity of the presence of the Egyptian officers in Cartagena to invite them to visit our facilities, who showed great interest in our developments, particularly in the MINEA naval mines, MILA for special forces and the MIRS system. This visit corroborates the great interest, good relations and trust that the Egyptian army has placed in SAES.